Logitech has launched a new set of accessories for your noetbook, the Logitech Notebook Kit MK605. 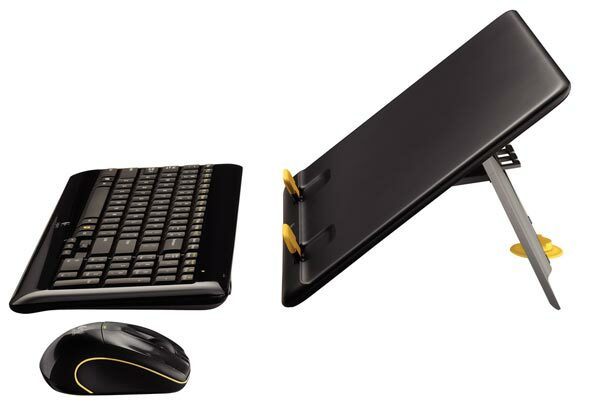 The Logitech Notebook Kit MK605 features a pivoting notebook stand as well as a wireless keyboard and mouse, it is designed to be used as an all in one solution to use your notebook at your desk. The notebook stand lets you choose from three different angles to view your notebook screen, and it is designed to bring you notebook to eye level, it can take notebooks up to 15.6 inches. The wireless keyboard and mouse come with the Logitech Unifying receiver that lets you connect a range of devices to your PC at once.